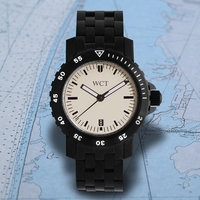 The West Coast Time Blackfin DIVER is manufactured in Germany and is packed with German engineering. Like its big brother the WCT 1000 the Blackfin diver is a true professional grade dive watch with a military inspired style design. It has the time proven Swiss ETA 2892-2 movement to assure reliability, durability and lifelong serviceability. Each and every watch is pressure tested to 1000 feet / 30 atm. The BLACKFIN Diver was designed with a dial and hand to be exceptionally clean and simple to read regardless of environmental conditions. Both the dial and hands have excellent low light visibility thanks to a double coating of C-1 Superluminova. The watch ships with a matching titanium bracelet. The entire watch case and bracelet are DLC coated. Price is $1695.00 USD + $39 shipping via overnight insured delivery in the US and $50 for worldwide express. Due to limited supply, this watch is offered on a first come, first served basis. Payment is due in full at time of order. PLEASE place your order via EMAIL ONLY and I shall email back your order confirmation. Your order can only be considered complete once payment has been received. Watch is covered by a full one year warranty from WestCoastTime against defects of workmanship.